Tornesh Dryer – Carrier Vibrating Equipment, Inc. In bulk material handling systems, dryers are used to remove moisture or undesired liquid from a substance. For this to happen, the dryer must facilitate evaporation whereby the liquid turns into a gas. Drying is essential to most bulk material handling facilities as moisture can compromise the quality of a product, especially if it will be stored or packaged for an extended period of time. It is also important that the dryer used in an application functions at a temperature range that is not harmful to the product being processed. Slurry Dryer – Carrier Vibrating Equipment, Inc. Depending on what kind of bulk handling application the dryer is being used in, a food dryer, industrial dryer, or parts dryer may be used. Three primary methods are used to dry bulk substances and materials: spray dryers, infrared dryers, and air dryers. An air dryer works by bringing the bulk product into direct contact with either hot or cold air. 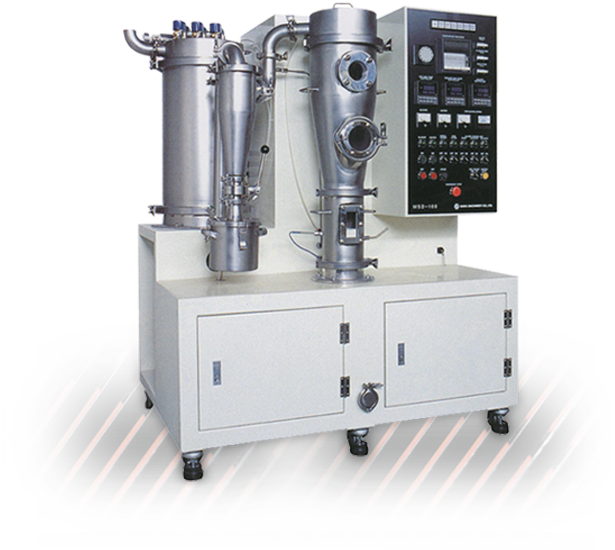 Freeze dryers, flash dryers, rotary dryers, and fluid bed dryers are all commonly used for applications that range from food processing to pharmaceuticals to agricultural bulk products. 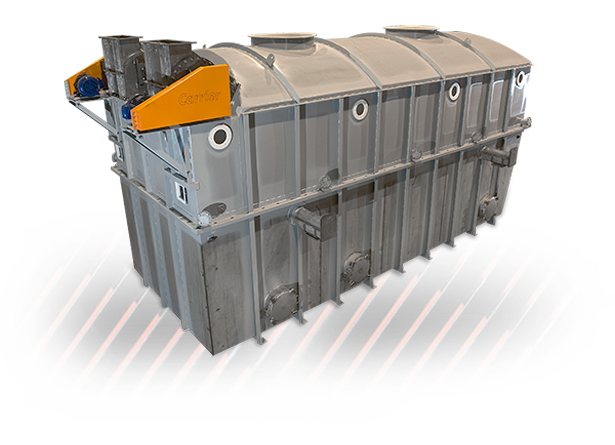 Technologically advanced infrared dryers take energy from an infrared wavelength and use it to extract the moisture from the inside of a substance without overheating it and damaging its properties. 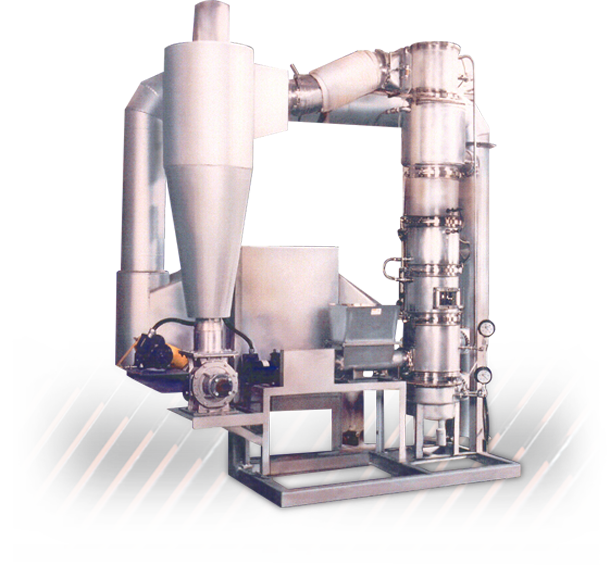 The third type, spray drying, is a popular method in bulk food processing systems. A spray dryer can dry batches or a constant stream of material on a conveyor. Sometimes these dryers are mounted over a conveyor that pulls that bulk material through the dryer. Coal Dryer – Carrier Vibrating Equipment, Inc. Heavy, wet bulk materials pose a unique challenge when it comes to drying in a bulk material handling system. In cases like this, rotary dryers are used. A rotary dryer has a rotating drum that is heated by hot air. When the bulk materials are placed inside the drum, they are guided through several heated chambers to dry them in stages. Bulk powders are often dried this way. Advantages of a drum dryer include its ability to process both fine and coarse solids, its durability and its extremely high drying temperatures with maximum efficiency provided by minimal heat loss. Food processing facilities sometimes use what is called a fluid bed dryer. A fluid bed dryer has a permeable surface that is able to support bulk materials. As heated air or gas is released into the dryer, the particles start to vibrate. Food like cereal can be easily dried this way since the particles are mostly uniform in size. Fluid bed dryers are affordable, well suited to fine grained materials, recover heat well, and do not damage temperature-sensitive materials. As technology improves and bulk material systems evolve to process higher volumes of material, dryers continue to be manufactured in larger and larger sizes. With multiple heat sources and chambers, many industrial dryers can now dry high volumes of material in a very short amount of time. With the right dryer or set of dryers in a bulk material handling system, substances can be adequately dried and prepared for shipping and storage without any risk of product deterioration due to the presence of moisture. When selecting a dryer for a bulk material handling system, the particle size, density, and viscosity of the material should all be carefully considered. The volume and rate of material being dried will also help to determine which dryer is most appropriate for an application. Dryers are now available in many different models with a wide range of industries and purposes in mind, so it is possible to select a dryer that is optimal for your bulk requirements. Dryers In bulk material handling systems, dryers are used to remove moisture or undesired liquid from a substance. For this to happen, the dryer must facilitate evaporation whereby the liquid turns into a gas.